Crave Invoice is an invoicing and inventory software. You can create and manage your quotations, sales invoices and customer payments for multiple companies. You can also track inventory and purchases for multiple stock locations in your company. Crave Invoice is an invoicing and inventory software. 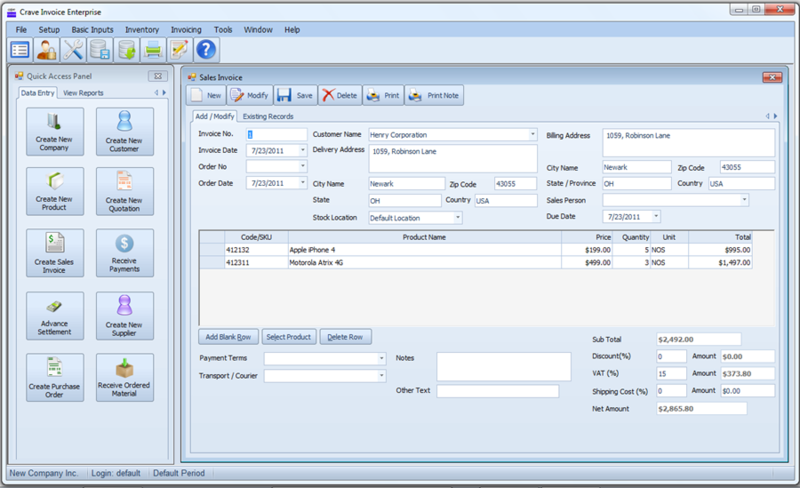 You can create and manage your quotations, sales invoices and customer payments for multiple companies. You can also track inventory and purchases for multiple stock locations in your company. It is also possible to track minimum stock inventory items. You can create purchase orders for the minimum stock items with just few clicks using this software. Crave Invoice has an in-built report template designer which gives you full control over the report print for quotation, invoice and purchase order. You can also create invoices for consultancy and other types of services you provide to your customers with Service Invoices. You can also setup and generate recurring service invoices at specific intervals such as daily, weekly, monthly, bi-monthly and yearly. With 20+ detailed and analytical business reports, you will have full control over the sales, purchase and inventory of your business. Barcode Label Generator software can create bar codes stickers images to tag. Barcodes Software can use in multiple industry to create identification and tracking of any goods, also help in sell and purchase of products. Barcoding is simple tool. This site does not contain serial number, crack, keygen Crave Invoice Enterprise serial number : serial number is the simplest type of crack. A serial number(cdkey,product key,etc) is register the program as you may already know. a crack or keygen may contain harmful software. If you cannot find the exact version you want, just give it a try. for more information read .nfo/.txt/.diz file include in zipped file.